Determine the potassium concentration in the aquarium using an accurate test kit before supplementing. Shake this product well before each use. 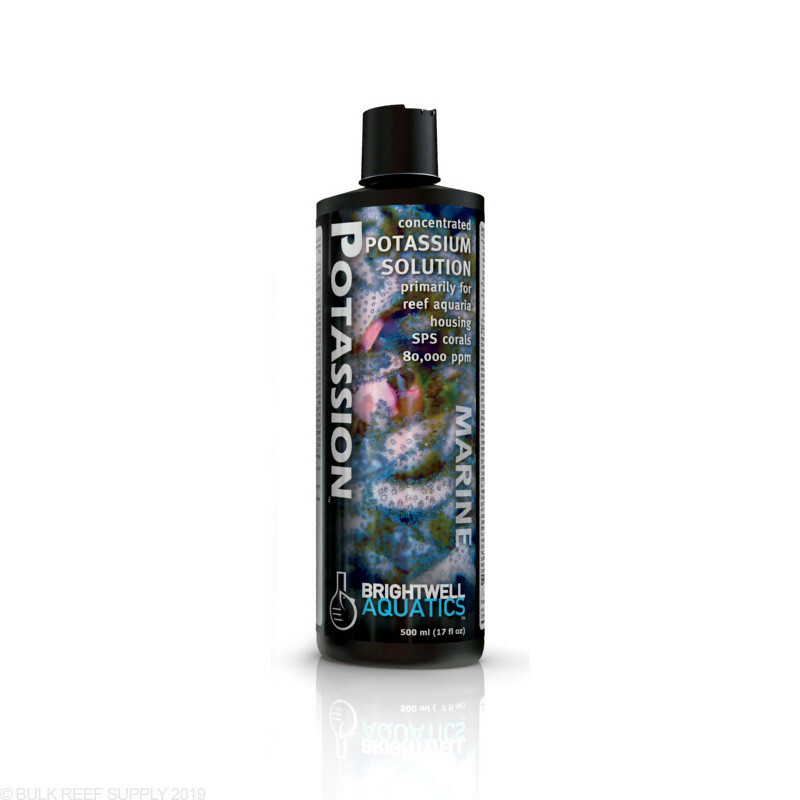 Each ml of Potassion will increase the concentration of potassium (“[K+]”) in 1 US-gallon (3.785 L) of water by approximately 21 ppm. If the initial [K+] in the aquarium is below 390 ppm, add this product at the maximum rate of 10 ml per 20 US-gallons daily until the potassium concentration measures between 390 - 410 ppm, then dose daily or weekly as needed (see below). Always try to maintain the [K+] within a range of +/-10 ppm. To determine the dosing rate of this product once the desired [K+] has been acquired, measure the daily rate of potassium uptake (i.e. the decrease in potassium) in your aquarium by measuring the [K+] at the same time each day over a one- to two-week period. To determine the daily dosing rate (preferable to weekly dosing) for potassium maintenance: estimate the volume of water in the entire aquarium system; divide the daily decrease in [K+] by 21; multiply this number by the volume of water in the system to get the daily dosage required (ml) to maintain a stable [K+]. Daily dosing maintains a more stable [K+] (and more natural environment) than dosing weekly, in which the [K+] spikes just after dosing and then gradually decreases throughout the course of the week. I've used this for about 2 months now to raise my Postassium levels into the ~450-500 ppm range with success. It works well and is inexpensive compared to most of the other options. Just make sure you are testing as you go and take it slow, corals will not appreciate a 600+ ppm Potassium level reached in a day. Just to foot stomp a part of the instructions though, *shake this well* before using it. I wasn't seeing much of an increase with my first bottle until I got about half way through and then my levels began rising fast as the recommended dosage. I was not shaking it well enough.